"In early September, General Sherman captured Atlanta, and overnight everything changed. Suddenly the end of the war seemed in sight and Lincoln had a commanding political position. In the election, Lincoln won fifty-five percent of the popular vote and captured all but three of the loyal states. Afterward, the military struggle took on the air of a de­nouement. Grant chased the southern armies to the point of near sur­render. Sherman, who had said that the moment the war stopped he would do his enemies any personal kindness, began his punishing march to the sea, intended to make southern civilians feel the pinch of war. 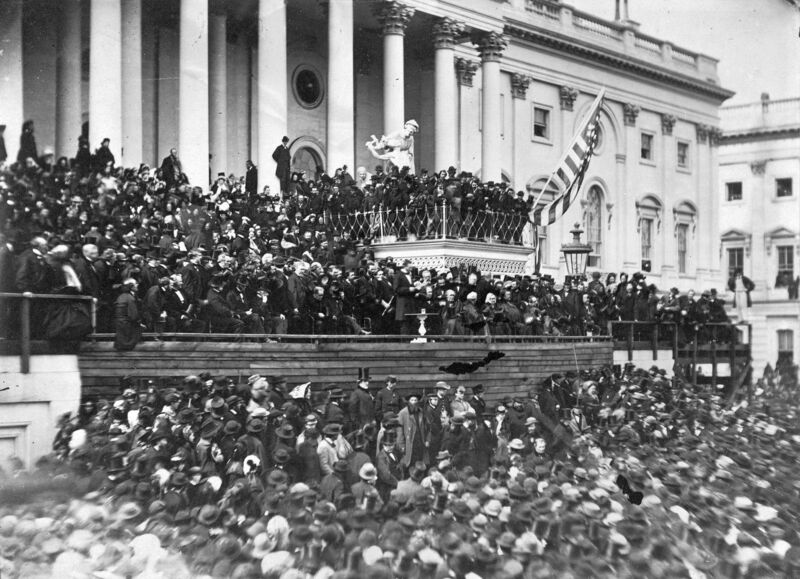 This image of Lincoln delivering his second inaugural address is the most famous photograph of the event. Lincoln stands in the center, with papers in his hand. "These words were a peroration, not just to the speech but to Lincoln's whole career. The cause worth struggling for went beyond any partisan or temporal sense of right or wrong. There was a supreme right that all people should work for, regardless of what agony or joy it brought in the short term. Hindrances to that goal might be frustrating or excruciating, but the goal could be defeated only if the people forsook it. Moreover, while achievements could bring the country closer to the goal, they would forever fall short of its full realization. Mortal works were imper­fect, but were dignified insofar as they reached, worked, and suffered for perfection.
" 'Malice toward none' was hardly a popular slogan. Consider the words of Henry Ward Beecher, as popular and influential in his day as Billy Graham has been in his. 'I charge the whole guilt of this war,' Beecher said in 1864, 'upon the ambitious, educated, plotting political leaders of the South ... A day will come when God will reveal judgment, and arraign at his bar these mighty miscreants.' Beecher looked forward to the day when 'these most accursed and detested of all criminals' would be 'caught up in black clouds full of voices of vengeance and lurid with punishment' and 'plunged downward forever in an endless retri­bution.' 'Endless retribution' -- now there was a phrase that people would rally behind. What Lincoln sought to forestall would in fact come to pass. A vengeful reconstruction policy, the backlash it provoked, and the failure to provide adequately for the well-being of four million freed slaves had ramifications that would last to the present day."